The “ball and socket” hip joint consists of a femoral head (or head of the thighbone) and the hipbone socket, otherwise called the acetabulum. The femoral head is covered with cartilage and enclosed in a capsule, and is connected to the femoral shaft by the femoral neck. The femoral neck is at an angle of about 120 to 125o to the femoral shaft. The hip joint is commonly affected by degenerative pathologies, of which osteoarthritis is most common. Being one of the most common debilitating and disabling conditions affecting the elderly, there is a 25% risk for those over the age of 85 developing hip osteoarthritis. These individuals are also at an approximately 10% risk of having to undergo total hip replacement due to end-stage osteoarthritis. For persons over 65 years of age, over 50% have some form of radiological evidence of osteoarthritis in general, which could be asymptomatic at the time of examination. Cartilage destruction is a main feature of osteoarthritis, although it is a disease that affects all structures present in the joint. Biomechanical stress is, therefore a critical component that contributes to the development of osteoarthritis. This then leads to cellular and molecular changes, which further contributes to the degradation of the joint. In the sporting population where joint injuries are common, there is a greater prevalence of early onset osteoarthritis. Football players, for example, are 5 to 12 times more likely to develop osteoarthritis compared and are diagnosed 4 to 5 years earlier when compared to the general population. Pain at the front and side of the hips with load bearing. Pain may also radiate down to the thigh and knee. Stiffness, especially in the morning. This usually improves in less than 1 hour. It is more prevalent in the elderly. An increase in Body Mass Index (BMI) has been associated with an increase in hip osteoarthritis. Caucasian and European population are at a greater risk than Asians, Africans and East Indians. Genetics can explain the disparity seen in different ethnicities, but how it affects hip osteoarthritis development remains unknown. Previous joint injury, such as labral tears. 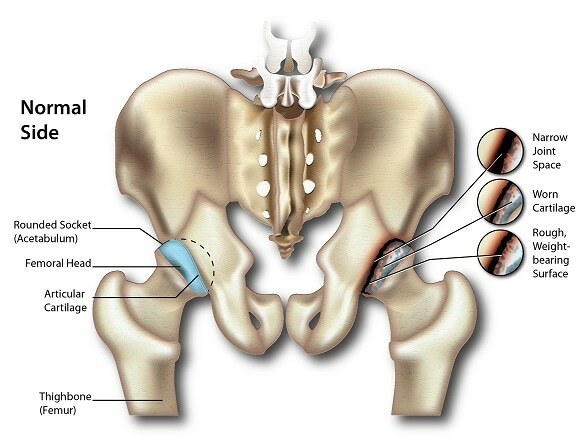 Femoroacetabular impingement – this is a range of conditions caused by abnormalities in the joint morphology, and eventually leads to hip pain. Developmental disorders – conditions such as Legg-Calve-Perthes disease and congenital hip dislocation have been related to greater risk of hip osteoarthritis. There is a higher prevalence in males who routinely lift heavy loads in Europe and the United States. There is also a higher risk in the farming population. Participation in running can present a low risk for hip osteoarthritis, while participation in high intensity, direct impact sports such as hockey increases the risk of osteoarthritis development even more. Leg length disparity- this can be a risk for osteoarthritis, but may also develop because of osteoarthritis. Hip osteoarthritis can be classified as either primary or secondary depending on whether there was a pre-existing joint abnormality that led to the condition. If there isn’t any pre-existing joint condition, then it is classified as primary, otherwise it is classified as secondary. The clinical history and a physical examination can provide enough reasonable evidence towards making a diagnosis of hip osteoarthritis. Plain radiological findings will make the diagnosis definitive, as there should be characteristic features present such as narrowing of the joint space. A differential diagnosis, where other possible pathologies are taken into consideration before making any conclusions, should also be done. A differential diagnosis may also be revisited if the patient’s conditions do not improve when treated. Treatment of hip osteoarthritis can be non-invasive and is usually multimodal. First and foremost, it is crucial for all patients to be educated on self-management of the condition. Physical therapy can be beneficial for those individuals with osteoarthritis as well as strengthening and stretching exercises. Other methods can also be employed, for example the use of a walking stick. Conservative treatment of hip arthritis can include the use of alternative/complementary medicine such as hyaluronic acid injections, non-steroidal anti-inflammatory drugs (NSAIDs) and corticosteroidal injections. The latter can provide short term relief, lasting up to 3 months. While NSAIDs can provide temporary relief and restoration in function, it comes at a risk of gastrointestinal bleeding. Some have stated that it also increases the progression of hip osteoarthritis, but there is no conclusive evidence to support this. Surgery or Total Hip Anthroplasty, THA (that is, hip reconstruction or replacement) can be done for persons not responding to conservative treatment, and has been found to be cost-effective. Hip resurfacing is an alternative to THA in the young and active population, but there is a higher prevalence of reoperation, and so should only be done for carefully selected individuals. Cibulka MT, White DM, Woehrle J, Harris-Hayes M, Enseki K, Fagerson TL, et al. Hip pain and mobility deficits–hip osteoarthritis: clinical practice guidelines linked to the international classification of functioning, disability, and health from the orthopaedic section of the American Physical Therapy Association. J Orthop Sports Phys Ther. 2009;39(4):A1-25. doi: 10.2519/jospt.2009.0301. PubMed PMID: 19352008; PubMed Central PMCID: PMCPMC3963282. Anandacoomarasamy A, March L. Current evidence for osteoarthritis treatments. Ther Adv Musculoskelet Dis. 2010;2(1):17-28. doi: 10.1177/1759720X09359889. PubMed PMID: 22870434; PubMed Central PMCID: PMCPMC3383468. Murphy NJ, Eyles JP, Hunter DJ. Hip Osteoarthritis: Etiopathogenesis and Implications for Management. Adv Ther. 2016;33(11):1921-46. doi: 10.1007/s12325-016-0409-3. PubMed PMID: 27671326; PubMed Central PMCID: PMCPMC5083776. Lee HH, Chu CR. Clinical and Basic Science of Cartilage Injury and Arthritis in the Football (Soccer) Athlete. Cartilage. 2012;3(1 Suppl):63S-8S. doi: 10.1177/1947603511426882. PubMed PMID: 26069610; PubMed Central PMCID: PMCPMC4297167.